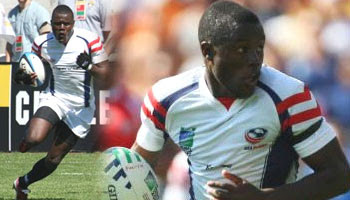 Takudzwa 'Zee' Ngwenya was probably the most talked about player at the recent Rugby World Cup 2007. His try against the Springboks when he ran around Bryan Habana created a huge amount of hype, and was later named IRB Try Of The Tournament. Ngwenya was inundated with phonecalls, interviews and received overs from a few clubs in Europe. He later chose to sign with French Top 14 team Biaritz and if all goes well, his star will continue to rise. I watched him play for them on the weekend, and there's no doubt that he has electric feet. Whenever he got the ball there was a buzz and he managed to normally step past the first defender. I do feel he still needs to work on other aspects of his game though - his hands being one of them. But that will come with time and experience. Before heading to Biaritz though he managed to travel with his country's Sevens team to the George leg of the IRB Sevens last month. Against Canada, in the same game that we saw this huge hit, Ngwenya came on fresh off the bench. With literally his first touch of the ball he scored. The large crowd who were keen to see him in action weren't disappointed, and with his little inside out, he's shown that he's no one try wonder. Look, this guy has talent, but is he suited for 15 man rugby? Not so sure. SA produces a lot of guys like him with quick feet who are good at 7's, but cant make the grade at 15's - its also why we cant beat NZ and Fiji at 7's - their lads combine pace and quick feet with power as well. Ngwenya's defensive frailty led to the one try by the opposition 10, and I forsee a few more. But maybe playing up North he will get the right coaching to improve in all aspects - otherwise he will be like another Southern African export - Brent Russel - who got eaten in that excellent Tait try. As an aside, there were a few guys saying Ngwenya was quicker than Habana after his try, despit him admitting that he wasnt - if you watch the clip of the try that he was largely responsible for conceding, you will see the opposition flanker keep up with him quite well - the lad has brilliant feet, like Jason Robinson, but he isnt lightning quick. Hell he is quicker than me but then so is you average water cooler. He's Zimbabwean by the way. Zimbabwean-born, now of US nationality. Calling him Southern African is correct, to call him South African would be incorrect. aaaaah just have him start hanging out with todd and he will learn some defense and develope some strength. Man give the guy a break. To me he is the best rugby player the U.S has right now. It's not like anybody on the U.S team is any better. He will learn remember he's only 23. And all we've got is Chavanga and 4 million refugees! CAUCAU would burn Ngwenya and Habana like it aint your business. wikkiam ryder or sirevi, back in his day, could have done that with half the space!! still his try in the world cup was pretty damn good! !